Is surgery in case of osteoarthritis of the thumb (rhizarthrosis) unavoidable? Which conservative therapy approaches are there? What can be done in persistent cases? Will cortisone injections help alleviate the symptoms of this condition? Isn´t it very dangerous to inject cortisone into a joint? Which holistic therapy approaches may be considered to treat carpometacarpal osteoarthritis? No! Surgery on the thumb saddle joint is only unavoidable if the pain and discomfort persists over an extended period of time and none of the attempted conservative therapy approaches seemed to address the issue. In milder cases it may suffice to rest the thumb possibly by immobilizing it for a little while. In addition the application of ointments supplemented by short-term use of an antirheumatic agent many times will help overcome acute pain. In those cases where the symptoms mostly seem to be prompted by performing activities that put strain on the thumb the use of an orthosis for the first extremity (thumb) may be beneficial. However such splint should only be worn when putting strain on the thumb rather than continuously! 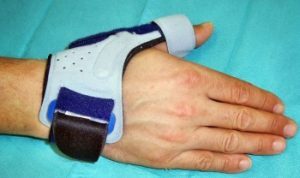 The image shows one of the many customary thumb splints that are available for the conservative treatment of rhizarthrosis. When using such splint it is of utmost importance to make sure that the remaining fingers as well as the thumb interphalangeal joint remain movable! Yes, if the joint line of the thumb saddle joint has not become too narrow yet, an injection with cortisone may provide relief for an extended period of time. The image on the left shows a practical example of a cortisone injection into the thumb saddle joint. After thorough disinfection of the affected area the skin above the thumb saddle joint is numbed. Once the numbing effect sets in, the injection into the thumb saddle joint with the help of a thin cannula is performed. 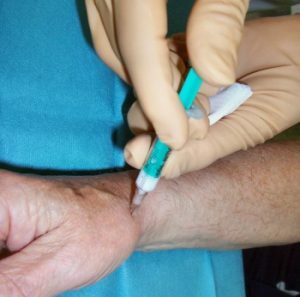 (Performing such cortisone injection deep into the thumb saddle joint is much more difficult than for instance administrating an injection into a knee joint, as the joint line in a thumb obviously is much smaller). This therapy approach certainly bears its risks as well: On very rare occasions a severe infection of the joint may occur (which then would result in an emergency surgery). A more common risk is the emergence of an atrophy of the skin and the fatty tissue in the area of the injection. A strong effect of the cortisone onto the entire organism however need most likely not to be feared as long as the correct dosage has been administered and injecting cortisone remains a one-time-approach. 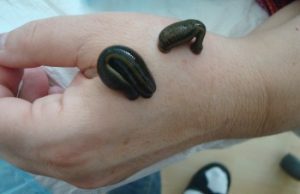 When selecting leech therapy to treat carpometacarpal osteoarthritis only specifically bred medicinal leeches should be used in order to avoid infections. The leech is positioned close to the area of the hand that has been affected with osteoarthritis. The leeches then draw blood, much like a small “bloodletting”, approximately 25 ml (that is about the same quantity as a blood withdrawal experienced at a physician´s office). The saliva of a medicinal leech contains hirudin and several other substances which so far cannot be reproduced in an artificial manner. Leeches have been applied in medicine for thousands of years. Hand surgeons use leeches in post-treating replantations of limbs and for other severe injuries. Another holistic approach in treating carpometacarpal osteoarthritis is the use of a low level laser. A patient suffering from osteoarthritis should choose a primarily lacto-vegetarian nutrition with plenty of fresh fruit and vegetables. This form of nourishment will prevent the tissue from acidification. This procedure entails the placement of a patch on the skin above the area affected by osteoarthritis. The venom Cantharidin stimulates the blood circulation and accelerates the disposal of the tissue fluids (lymph). A blister appears where the patch sits; however it will disappear later without leaving a scare (in some cases it leaves behind a discoloration on the skin).